Science museums may seem a little boring to some, but this cannot be said about the Science museum in London. This page is just one on this site giving you a short over view of some of the galleries and exhibits on show at the museum. This page covers the exhibits on display on the first floor of the museum. There is some temporary exhibition space on this floor which I will not cover as it is constantly changing. you can be assured though, that whatever is on display when you visit it will be attention grabbing. This gallery is all about the stuff which surrounds us and what makes up our modern world. It is also about how materials have developed and continue to change to help improve our lifestyles. There are lots of items which you will be used to seeing in your everyday life such as kettles and glass bottles etc, but you will also come across some amazing objects such a huge layered wall made up with 213 different materials ranging from fur to aluminium and everything else you can think of. 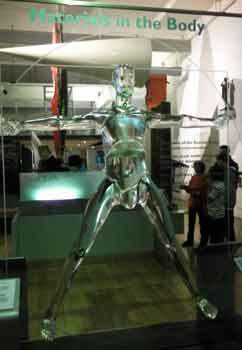 A Perspex man which shows how different materials such as metals and silicon are used to repair the human body and a dress made from carpet. These are just a few of the strange but fascinating items in this gallery. Discover how materials behave in certain ways and how their properties lend themselves to specific uses. As the name suggests this gallery is concerned with the world of communication and the technology which makes it possible. It shows the history and development of telecommunication devices such as the telephone and radio and how they have changed the world we live in today. the developments being made in telecommunication devices then. how it would look in 1983. Even this so called modern office now looks very dated compared with the technology available to us now. Humans have always gazed into the heavens and have wondered where we fit into the bigger cosmic picture. This gallery explores mans relationship with star gazing and our fascination with the cosmos. The largest x ray telescope built in Britain which was sent into space to study X-rays cosmic events. A machine which was designed to search for the existence of "Dark Matter". This is a rather different gallery to the others in the science museum and does feel a little old fashioned. However if you like models and are interested in the development of farming then this gallery will fit the bill. 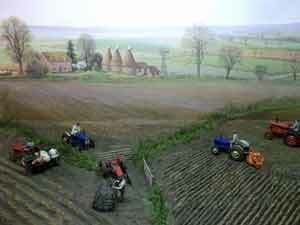 It contains many model scenes showing different farming equipment and practices, such as ploughing the fields with cattle and farming machinery. 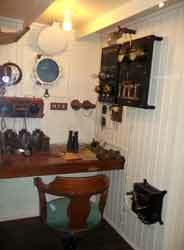 This gallery contains hundreds of examples of time pieces, ranging from beautiful pocket watches to grandfather clocks. The wells Cathedral clock one of the oldest mechanical clocks in the world is also in the gallery. The gallery takes you on a history of time keeping and how the methods have changed over the years right up to today's modern quartz watches. I don't have a particular interest in clocks etc and so I thought that I would just make a quick tour around this gallery and move on. However the display on show is rather special and much more captivating than I would think a load of clocks could be. They are displayed very well and are very well lit which has a funny way of drawing you closer for a better look at the intricate dials and cogs. The range of different time pieces also allows you to compare very easily how clocks and how we use them has changed. From grand highly decorated centre pieces in the home to small rather plain and functional wristwatches. I did enjoy this gallery much to my surprise but then again I suppose it is the job of science museums like this to make subjects come to life and they certainly succeeded here.